Planbox is proud to announce that ERT, the leading cloud platform solutions provider delivering clinical and scientific innovation through its patient-centric data collection and intelligence solutions, has selected Planbox as its innovation management platform. ERT selected Planbox Innovate after evaluating six vendors during a three-month selection process. ERT’s key criteria included flexibility, automation, and the ability to deploy multiple, unique communities. Planbox’s built-in automation allows ERT to create unique rules for each community, ensuring all submissions are reviewed, evaluated and communicated correctly. For ERT’s Innovation Lab, ideas will be captured for advancing the collection of patient data in clinical trials across ERT’s Cardiac, Respiratory, Clinical Insights and eCOA divisions. The program will also welcome new ideas for improving or streamlining internal processes. Planbox will enable a consistent workflow for reviewing all submitted ideas and implementing those selected for exploration in the Lab. “We believe that Innovation cannot come from a single voice and using Planbox software invites many perspectives and input into each idea,” continued Beckstrom. As such, ERT will first release the software to its global employees, and in a second phase it will release custom communities for ERT clients to submit their ideas. 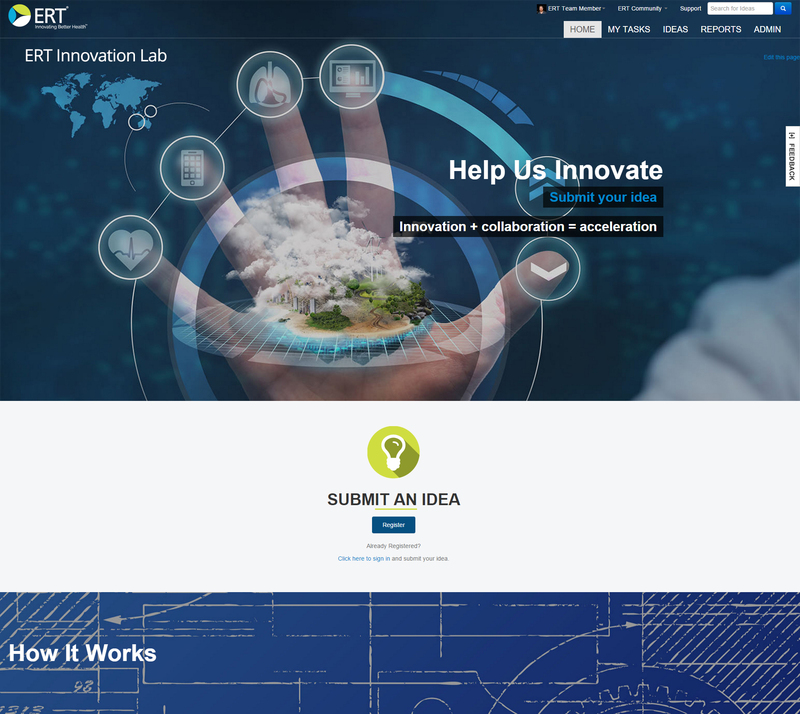 For additional information on ERT’s Innovation Lab or its proven cardiac safety, respiratory, and eCOA solutions and services, visit http://www.ert.com. Planbox (www.planbox.com) is the pioneering provider of cloud-based Agile Work Innovation solutions – from creative ideas to winning projects. Our mission is to help organizations thrive by transforming the culture of agile work, continuous innovation and creativity across the entire organization. Our family of products include Collaborative Innovation Management, Team Decision Making, and Work Management applications. Planbox is designed to be the agile work innovation tool for everyone, built for companies and teams of all sizes and trusted by some of the world’s most recognized brands including Bridgestone, CGI, Sempra Energy, Starbucks, Stanford, Philips, The Salvation Army and Verizon with millions of internal and external users. To learn more, visit: www.planbox.com and unleash your innovation butterfly. ERT (http://www.ert.com) is a leading provider of high-quality patient safety and efficacy endpoint data collection solutions for use in clinical drug development. ERT delivers a combination of technology, services and clinical consulting that increase the accuracy and reliability of patient data and improve the widely deployed solutions in centralized Cardiac Safety, Respiratory, Suicide Risk Assessment, electronic Clinical Outcome Assessments (eCOA) – which includes patient-, clinician-, observer- and performance-reported outcomes – and cloud-based analytics and performance metrics. By efficiently integrating these solutions through a system built upon a scientific and regulatory foundation, ERT collects, analyzes and delivers safety and efficacy data critical to the approval, labeling and reimbursement of pharmaceutical products. ERT is a global organization with headquarters in Philadelphia, PA and offices throughout the U.S., and in Germany, Japan, Switzerland and the U.K.